Would Democrats embrace JFK now? President John. 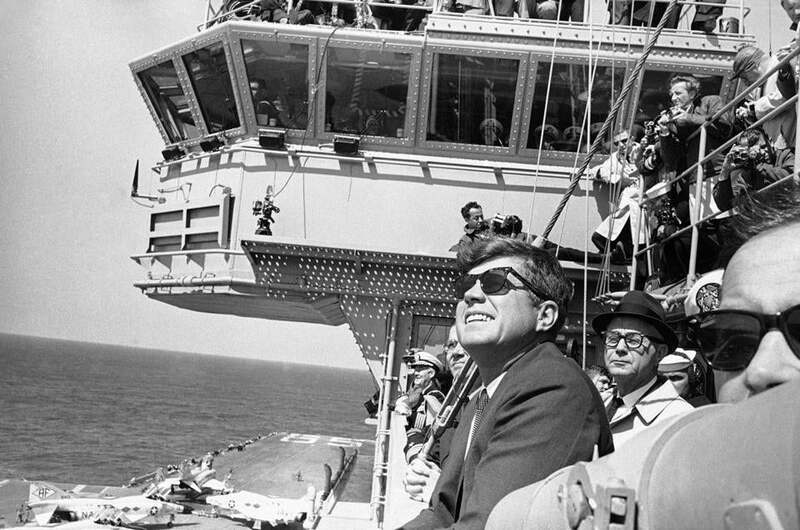 F. Kennedy looks into the sky as planes from the Carrier Enterprise maneuver in a demonstration off the east coast on April 14, 1962. As Democrats begin maneuvering for the 2016 presidential race, there isn’t one who would think of disparaging John F. Kennedy’s stature as a Democratic Party hero. Yet it’s a pretty safe bet that none would dream of running on Kennedy’s approach to government or embrace his political beliefs. Today’s Democratic Party — the home of Barack Obama, John Kerry, and Al Gore — wouldn’t give the time of day to a candidate like JFK. The 35th president was an ardent tax-cutter who championed across-the-board, top-to-bottom reductions in personal and corporate tax rates, slashed tariffs to promote free trade, and even spoke out against the “confiscatory” property taxes being levied in too many cities. Since that terrible day in Dallas 50 years ago, popular mythology has turned Kennedy into a liberal hero. Some of that mythmaking, as journalist and historian Ira Stoll argues in a new book, “JFK, Conservative,” was driven by Kennedy aides, such as Sorensen and Arthur Schlesinger Jr., who had always wanted their boss to be more left-leaning than he was. Some of it was fueled by the Democratic Party’s emotional connection to the memory of a martyred president, and its understandable desire to link their priorities to his legacy. But Kennedy was no liberal. By any reasonable definition, he was a conservative — and not just by the standards of our era, but by those of his era as well. Stoll draws on an embarrassment of riches to make his case. He hadn’t changed his political stripes by the time he ran for the Senate in 1952, challenging incumbent Henry Cabot Lodge Jr. Stoll notes that Massachusetts newspapers wanting to back a liberal in that race came out for the Republican — the Berkshire Eagle, for example, endorsed Lodge as “an invaluable voice for liberalism.” When his reelection in 1958 made it clear that Kennedy would be running for the Democratic presidential nomination, Eleanor Roosevelt was asked in a TV interview whom she would support if forced to choose “between a conservative Democrat like Kennedy and a liberal Republican [like] Rockefeller.” FDR’s widow, then as now a progressive icon, answered that she would do all she could to make sure Kennedy wouldn’t be the party’s nominee. Nearly 30 years ago, an essay in Mother Jones magazine asked: “Would JFK Be a Hero Now?” If the answer wasn’t obvious then, it certainly is now. In today’s political environment, a candidate like JFK — a conservative champion of economic growth, tax cuts, limited government, peace through strength — plainly would be a hero. Whether he would be a Democrat is a different matter altogether.